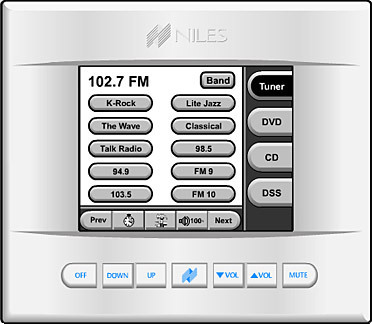 Niles Audio has released what they claim to be the world’s first plug-and-play touch screen. The TS-1, nicknamed Art, comes preprogrammed for any Niles MultiZone product and can be customized using a PC and their free software. The display is an easy to read, 3.8″ (320×240 pixels) high-resolution, gray scale touch screen with LED back lighting… I wish it was color like ones we’ve been seeing from other companies. A feature I really like is the 7 LED backlit hard keys that allow for quicker access to frequently used system controls. Retail price for this is about $500.